*This is a paid collaboration. Please see my disclosure policy for details. We had the opportunity to visit all 4 SeaWorld Parks this summer - SeaWorld, Busch Gardens, Discovery Cove and Aquatica. I have so much to share from this trip and I thought I would start with our family highlights. It is fair to say that we had THE best time in Florida. Others mentioned I’d be planning another trip as soon as I arrived home and I laughed it off but they were right - we’re already planning our return visit in a few years and have definitely caught the ‘Florida bug’. Florida is like no other place I have visited before. It’s full of experiences that I just never expected and the whole family had the best fun from sun up to sun down. 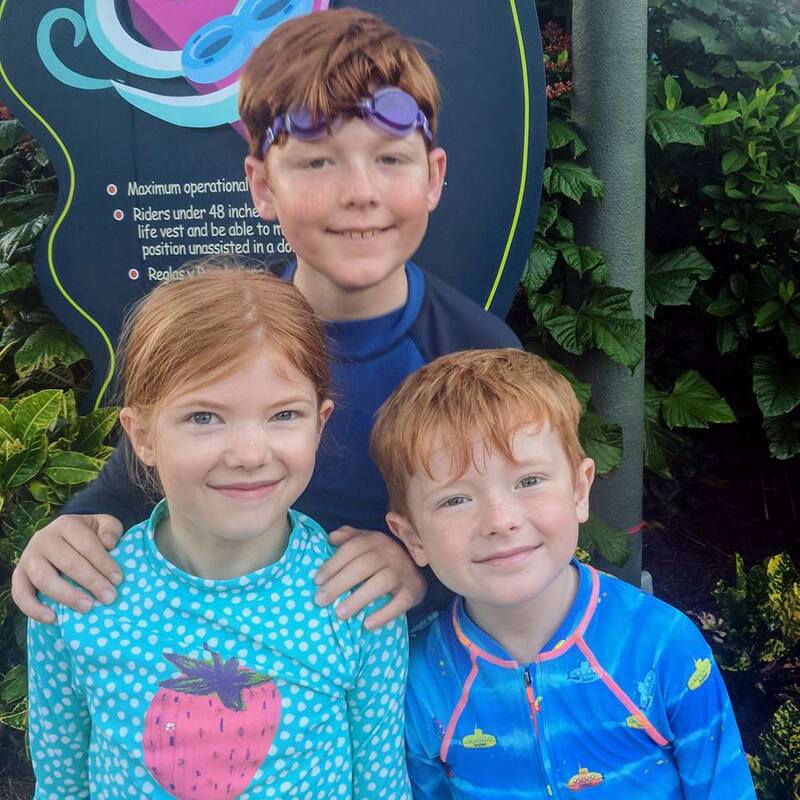 I was going to include our top five highlights in this post but it’s proven too difficult to narrow it down to just five so instead I’ve asked each family member to share their own personal highlights. There were so many trip highlights for me and I’ve really struggled with creating a short list but for me, riding Mako at SeaWorld has to be up there. Mako is Orlando’s longest, tallest and fastest rollercoaster. At 200 ft tall, this hypercoaster allows you to experience weightlessness as you reach speeds of 73 mph. I loved it so much I rode 6 times throughout the week! I am so proud that Harry mustered up the courage to join us on our last ride and it was fantastic being able to experience Mako with him. 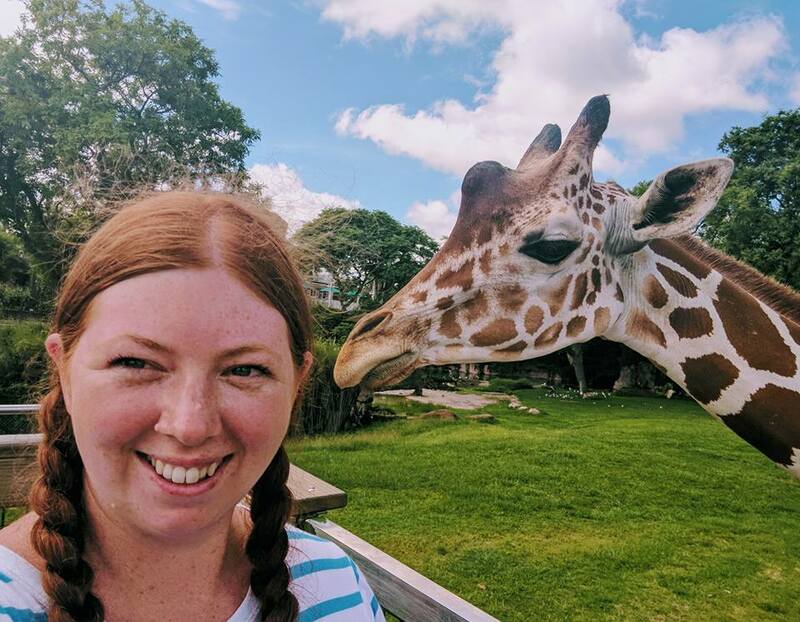 Another highlight for me was grabbing a selfie with a giraffe during the Serengeti Safari at Busch Gardens. I never expected to get so close to the animals and I think this has to be my best selfie to date. I have stuck this photo on my fridge and it’s a picture that really puts a smile on my face whenever I see it. As part of our trip we were taken on a Behind the Scenes Tour at SeaWorld and around the animal rehabilitation centre. This can be booked as an optional extra and I would say is definitely worth doing. We discovered how rescued sea turtles and manatees are cared for and the work that goes into rehabilitating them back into the wild. I was moved to tears as I saw first hand some of the injuries that animals had sustained due to accidents with boats and fishing nets and this part of our trip really has left a lasting impression on how we can all help to keep our marine life safe. A holiday isn’t a holiday for me without a few moments of relaxation and my favourite way to do this was to float along a lazy river. There are a few to choose from in the SeaWorld Parks but my favourite was Roa's Rapids at Aquatica. The rapids do all of the work for you and whisk you along past swirling whirlies and gushing geysers - you just need to lie back and relax with no distractions. Bliss! Steve is a bit of a thrill seeker and in our pre-children days we used to regularly visit theme parks and ride the latest white knuckle rides. Taking a trip to Florida allowed Steve to relive his youth a little and he loved being able to experience many of the extreme rides that SeaWorld Parks has to offer. One such ride was Falcon’s Fury at Busch Gardens. This ride takes you 335 ft high, tilts you so you are facing the ground and then unexpectedly drops at 60 mph. Not one for the faint hearted but definitely lots of fun! 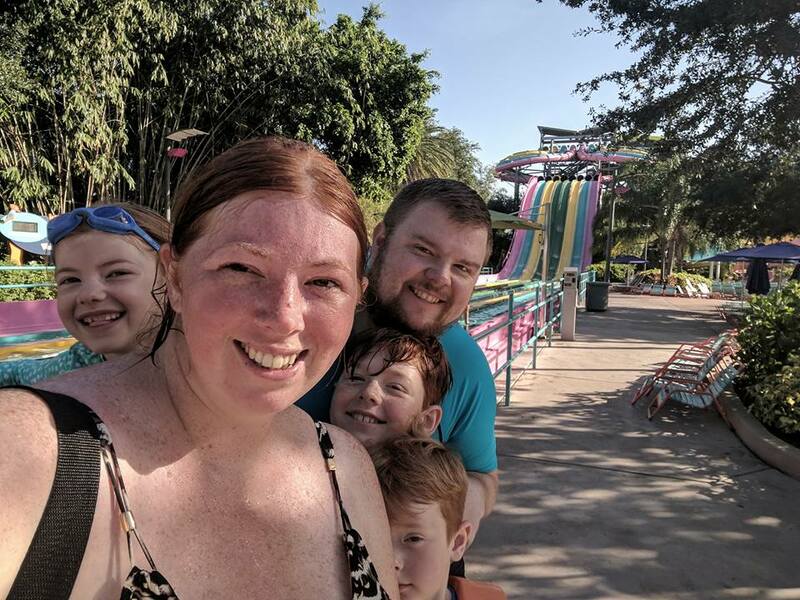 Steve really enjoyed the water parks too and his favourite ride from the whole trip was Ihu’s Breakaway Falls at Aquatica. This slide involves you standing on a platform only for it to ‘break away’ under your feet and you experience a free fall before riding this super quick slide. This is one of the only times I’ve heard Steve scream on a ride and it was hilarious watching his face! Tigers are Steve’s favourite animal and at Jungala at Busch Gardens Steve managed to get the closest he’s ever been to this magnificent creature with the help of a special glass viewing box. The Bengal Tiger likes to sit on top of the box and you can pop your head in to get a very close look. I was honestly astounded at how big a tiger’s paw is! Finally, Steve loves his food and Twisted Tails Pretzels at Busch Gardens was a real foodie highlight from our trip. These pretzels have to be the best pretzels ever and come in a wide variety of flavours from cheeseburger to pizza. Steve highly recommends trying the bacon pretzel - you won’t regret it! Harry’s favourite activity from our whole trip was SeaVenture at Discovery Cove. This experience is only open to adults and children aged 10+ and I have to say, it’s the activity I was most nervous about trying myself. SeaVenture allows you to take a 20 minute walking tour along the ocean floor without any prior diving or SCUBA certification. We were able to get up close with lots of sea creatures, come face to face with sharks (behind glass), hold crabs and experience tropical fish feeding around us. I never expected that Harry would be able to take part in something like this but I’m really pleased he was able to as it was such a memorable experience and one I don’t think Harry will ever forget. During our time in Florida, Harry was keen to conquer some of the extreme rollercoasters and rides and Kraken Unleashed at SeaWorld was the first ride we tried. This is a virtual reality roller coaster like you’ve never experienced before and a very different experience - you ride the coaster wearing a VR headset so can’t anticipate where the ride is taking you. We were shocked when the ride was over and discovered we’d been upside down seven times! It certainly didn’t feel like it. The next big ride Harry tried was Journey to Atlantis and by the end of the week, Harry’s confidence had really grown - so much so that he begged us to take him on Mako and Manta too. So we did and he loved them both. I am so chuffed that Harry managed these rides and it’s fair to say that after riding Kraken Unleashed, Journey to Atlantis, Manta and Mako, he now feels like he can take on anything. You may remember that we adopted an Orangutan a few months ago and visiting another was at the top of Harry’s to-do list. He was thrilled when an Orangutan walked right up to the glass in the Jungala area at Busch Gardens and we spent a few magical moments exchanging silly faces. Harry’s final highlight was definitely our trip to Aquatica. He managed to take on every slide except Ihu’s Breakaway Falls and loved every second. His favourite slide was Dolphin Plunge where you speed through a pod of black and white Commerson's dolphins. Heidi is such a sweet and caring girl and she has a real soft spot for animals. In the weeks leading up to our trip all she would talk about was how excited she was to swim with dolphins at Discovery Cove. You can enjoy a full dolphin swim from aged 6 at Discovery Cove. It was really nice being able to experience a special moment like this together as a family. Swimming with dolphins certainly did not disappoint. Heidi thoroughly enjoyed interacting and swimming with dolphins Kayla and Daphnie and she was beaming from ear to ear the whole time. The whole experience is not pressured at all, taken at the dolphin’s pace and is a wonderful thing for children to experience. I have no doubt that swimming with dolphins is the first thing Heidi will tell her friends about when she returns to school and she could not resist buying a dolphin soft toy as a special memento from the day. Heidi is very small for her age and despite being two years older, is only 1-2 cm taller than Jack. This meant that she sadly just wasn’t tall enough to enjoy a lot of the bigger rides that she would have liked to. All was not lost though as she was super happy that she could ride Cheetah Hunt and Cobra’s Curse at Busch Gardens. Cheetah Hunt is a triple launch roller coaster and reaches speeds of 60 mph. It’s lots of fun as you actually speed up the inclines too. Heidi was delighted that she was able to experience what it’s like to turn upside down on this ride too. A real holiday highlight for Heidi was being able to race myself, Steve and big brother Harry down Taumata Racer at Aquatica. You ride this slide lying on your tummy on a mat and up to eight people can race at once. You’re all given a time at the bottom and it’s hard for your competitive streak not to come out. We enjoyed this slide a few times and had lots of fun together as a family trying to beat our previous times (and each other). 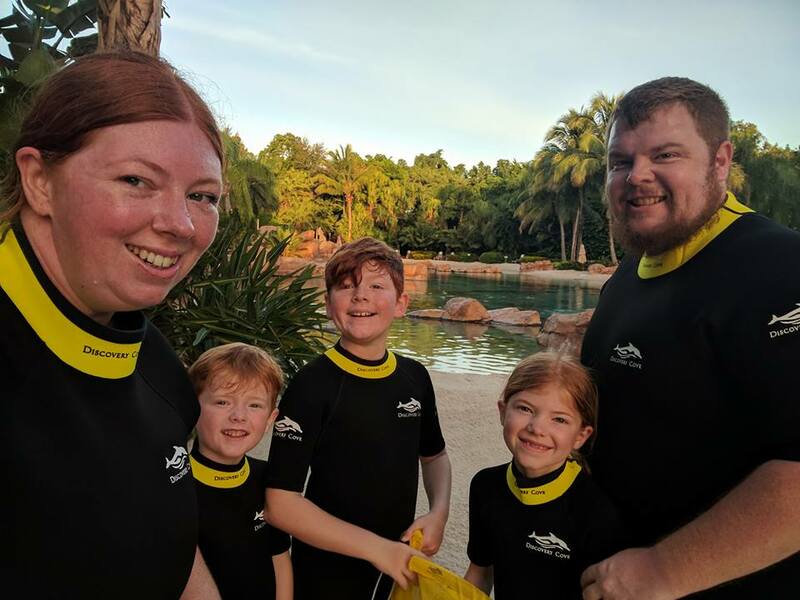 Heidi embraces any new challenge and I loved watching her swim with rays and get up close and personal with sharks at The Grand Reef in Discovery Cove. Heidi took to snorkelling like a duck to water, in fact she was better at it than I was and she was thrilled to be able to stroke rays as they swam past and watch real sharks sleep behind clear glass. You are allowed to keep the snorkel you use at Discovery Cove and Heidi spent every night pretending she was a shark and snorkelling from one side of the pool to the other during our evening swim in our hotel pool. Jack’s favourite experience in Florida was ‘Dining with Sharks’ at Shark’s Underwater Grill in SeaWorld which just happened to be the way we decided to end our time in Florida before heading to the airport. Jack’s favourite food is fish and surprisingly we didn’t find fish on any children’s menu in Florida apart from at Shark’s Underwater Grill. Jack ordered fish and chips and devoured every last bite. The food here is really very good and the children’s menu includes a special shark sundae which was a quirky treat that the kids enjoyed. This dining experience is unique as you are surrounded by sharks and Jack loved shouting ‘Shark’ whenever one swam past. Sharing our lunch with a shark is certainly something we did not expect to do at SeaWorld. Jack loves a good laugh and his favourite ride from the week had to be the Congo River Rapids at Busch Gardens. Jack could not contain his laughter as he anticipated us all getting soaked - which we did. Jack loved this ride so much that he begged us to ride three times in a row! Sea lions are funny animals and Jack loves anything that’s a little bit silly. He was provided with his own tray of fish at Pacific Point Preserve in SeaWorld to feed the Sea lions with and we had such a laugh watching the expressions on everyone’s faces. Jack’s final highlight was being able to walk through Lory Landing at Busch Gardens and hand feed a selection of tropical birds. We have taken part in experiences similar to this in the past, but I have to say, the experience at Busch Gardens has to be the best and Jack really enjoyed this close-up encounter. 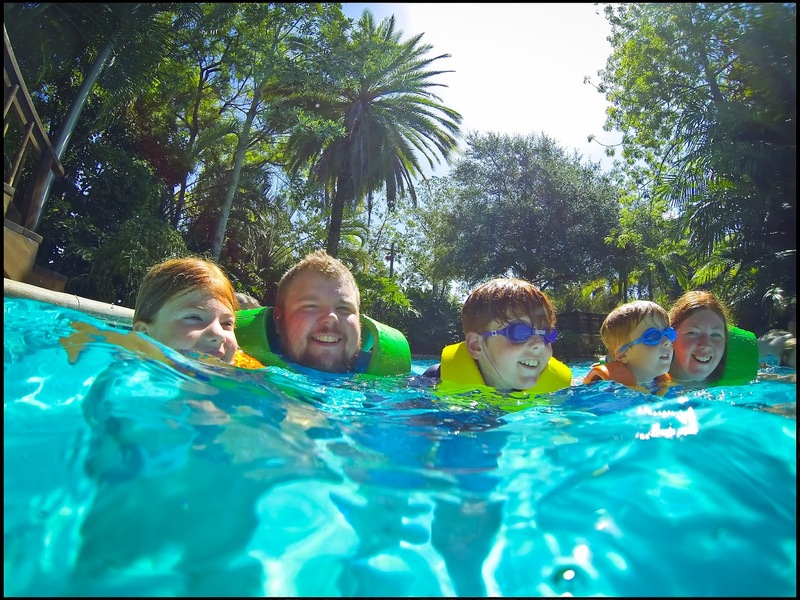 I could honestly go on…..we experienced so much across the SeaWorld Parks - SeaWorld, Discovery Cove, Busch Gardens and Aquatica were all so much fun. We took part in adventures that we never expected and all had the best time ever. There really is something for the whole family to enjoy in Florida and I know we’ll all still be talking about this trip in weeks, months and years to come. Let me know if you’ve tried any of the experiences I’ve mentioned or if you fancy giving any of them a go yourself. Please note: Serengeti Safari, Behind the scenes tour and SeaVenture are available at an additional cost. WOW! This really looks like the trip of a lifetime! We have been to Florida twice before we had kids and loved it both times. Second time we visited Miami and Florida Keys which were incredible. Florida seems to have something for everyone. Loved your photos, how brilliant for the kids to have them to look back on when they are older. oh WOW! When I was a youngster I nagged my parents over and over to take me to Florida but they always refused (I swear I've never forgiven them!) .. Simon and I have already decided that if we have children we'll definitely be treating them to a trip like this, it creates the most amazing memories! Very jealous of your giraffe selfie, I'd love one of those! The thing you can really see from your photos is how much the kids are enjoying every moment - their smiles are HUGE! They are going to remember this holiday forever! Phew I just feel exhausted reading what you got up to. Amazing - what a trip of a lifetime and one I hope to do one day, too! The Orangutan's face!! Looks like you had a Kraken time at Sea World. I so wish I was there right now. Although we've not done these parks in the past 10 years, I really want to try them out on our next trip to Florida. Discovery cove looks amazing and I'm so pleased the full family did it together. Experiencing something new can be scary and I know a child in our house who is afraid of nearly everything!